On Saturday 8th February we were asked to sing for Jane's vintage 1940's themed 40th birthday party in Bromley, London. The moment we were arrived and were greeted by a fabulous 1940's styled Jane we knew this party was going to be special. We weren't wrong! As guests flooded into the venue they transformed it back in time with their amazing costumes and hair. 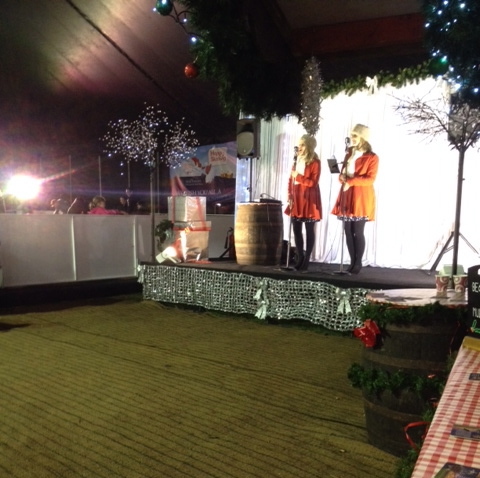 We have sung at many vintage events but we have never seen so many people go to so much effort. As we sung we were surrounded by men in uniform dancing with their lasses in tea dresses. We had a truly wonderful evening and were so glad to be a part of this party. On 4th January to kick off our 2014 gigs we were very excited to be asked to be a part of Karin and Dave's wedding day. The wedding took place at Chewton Glen in Hampshire an idyllic wedding location full of romantic treehouse's and stunning restaurants. The wedding took place late afternoon just as it got dark in a beautiful candlelit cermony room. Karin looked absolutely stunning and was met by a relaxed Dave at the end of the aisle. The ceremony was very emotional and as they left as a new Mr & Mrs we sang "I belong to you, you belong to me" which was requested by the couple as it was very special to them. We then made a speedy dash over to the summerhouse where they were holding the wedding reception and dinner. We entertained everyone as they drank champagne to celebrate the couple's marriage and later as they sat down to eat their wedding breakfast. Although this was a small wedding it was truly special and we were so happy to have played a part in making their wedding a day to remember. Congratulations to you both! "THANK YOU VERY MUCH! I think what you did at the wedding was fabulous. I would recommend you to anyone!" Karin Wood. On 31st December we were booked to sing at Restaurant 107 in Cranleigh, Surrey for their New Year Gala Dinner Dance. We donned our party dresses and headed down to this fantastic venue. We sang as all the guests arrived and drank champagne to start celebrations. They and us were then treated to a 7 course gala dinner which was exceptional before we started our build up to 2014. We sang party songs as people danced on a packed dance floor and before long it was time to ring in the New Year with Big Ben! We continued the party until people were ready to drop and make their way home! We had a fantastic evening and it was an absolute pleasure for us to sing to so many happy people. Happy 2014 everyone, thank you for a fabulous 2013 and here's to an even more fun 2014. We had a lot of lovely gigs over Christmas so have decided to do one blog with all them in it!! To kick them off in style we started our festive gigs at Blenheim Palace, Oxfordshire on the weekend of 15th,16th & 17th November. As expected, this incredible venue was breathtaking from the minute we drove up. Living Crafts were holding a weekend of christmas shopping at the Palace and we were asked to sing to spread festive cheer to all their shoppers. On the Friday we managed to find Pudsey for a photo as he was raising money for Children in Need. We met some great people over the weekend and look forward to returning there again soon. On Sunday 24th November we were booked to sing for Petworth House's Christmas Fair in West Sussex. We had a wonderful day singing for everyone who was enjoying pottering round all the wonderful stalls and stopping for a mulled wine or two! "Thank you so much for your wonderful performances yesterday. You really created a festive atmopshere and I could see how much people were enjoying listening to you." Karen Manton-Cook. On 30th November we were invited to sing as part of the Godalming Christmas Lights Switch On in Surrey. 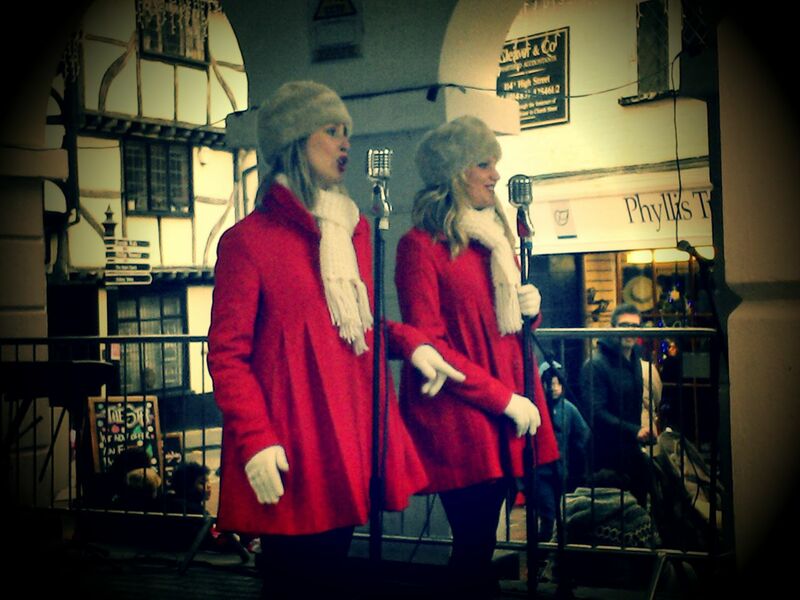 We had a brilliant time singing for a packed high street full of people starting their festive celebrations! "Christmas waves a magic wand over this world, everything is softer and more beautiful." Reigate on Ice launched their very first Ice Skating rink in Surrey this year and on the 2nd & 8th December we were asked to perform for them. The skating rink was set inside a fantastic circus tent fulls of german style christmas markets so people could have festive food and drink whilst watching the skaters whizz past! We sang an hour of our festive favourites to get the ice skaters in the mood and to ease the brusing when they fell over!! On Wednesday 11th Decemeber we were booked to sing at Canary Wharf station to entertain the commuters as they left work for the day. We had a fantastic time singing and cheered up the tired Londoner's as they made their way home, we even managed to get a few dancing! DLR were running a competition to guess what was wrapped up beside us as we sang. Can you work it out?!! Ha ha. 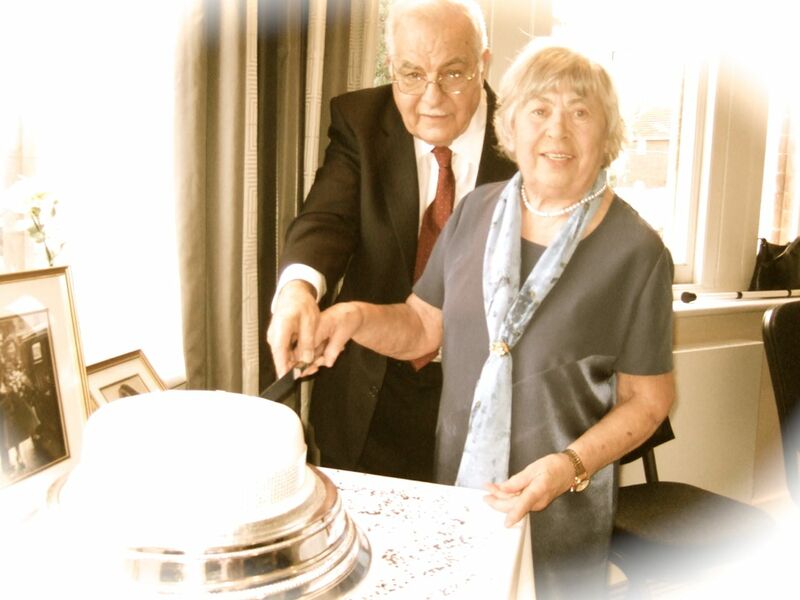 On Saturday 26th October we had the absolute pleasure of singing to celebrate Fred and June's 60th Diamond Wedding Anniversary in Berkshire. They asked us to sing our 1940's vintage set whilst they and all their friends and family enjoyed a wonderful afternoon tea. Inbetween our sets Fred made a beautiful tear-jerking speech about his wonderful wife and then a letter from the Queen was read out congratulating the couple! Fantastic! We then sang "We'll Meet Again" as the couple slow-danced together. We feel so priviledged to have played a part in such a special occasion and to have met such an inspiring couple. 60 years of marriage! Wow! We look forward to singing for Fred & June's granddaughter's wedding in April next year. "It was such a lovely afternoon, everyone enjoyed themselves immensely. You both made the afternoon with your superb performance. Thank you for doing a grand job." Carol Smyth.